A touch of subtlety is appreciated in this 3 stone contemporary engagement ring with half a carat in round brilliant diamonds, designed by Gabriel and Co. A white gold or platinum channel set band meets with a half carat of round brilliant diamonds and comes together perfectly in this 3 stone contemporary engagement ring, A mix of a halo and 3 stone style, this contemporary engagement ring is offered in your choice of white gold or platinum. 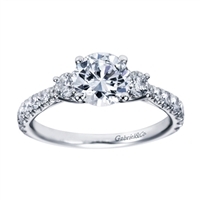 Two round brilliant diamonds accompany a round center diamond in this vintage style 3 stone engagement ring, available in white gold or platinum. 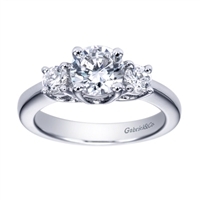 A simply set contemporary 3 stone engagement ring with 2/3 carats of round brilliant diamonds shimmering from your choice of white gold or platinum. 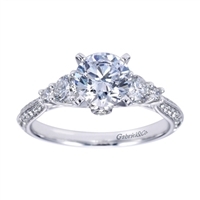 Shining bands of white gold or platinum rise towards the magnificent center of this 3 stone halo diamond engagement ring with half carat in round brilliant diamonds. 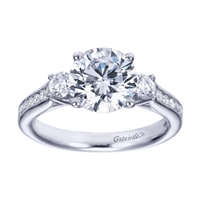 A 14k white gold 3 stone diamond engagement ring with round center stone by Gabriel & Co. A flawlessly crafted and impeccably styled contemporary three stone engagement ring with nearly one half carats in round diamonds. 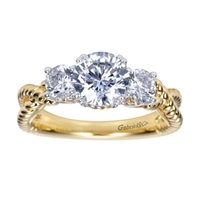 This contemporary 3 stone engagement ring has everything she could possibly want! Featuring round brilliant diamonds and available in 14k or 18k gold.